So, the second Calligra Spring ended about 8 hours ago*. What was news? I was there! If you told me a year ago I would be working along with top class programmers gathered from almost all around the world (well mostly Europe and Asia) I would simply call you a nutcase. I travelled around 3000Km just to prove myself wrong. Well, the fact was that I’ve never been on a plane before (merely of occurancies) so I didn’t know how things were gonna be there. I was pretty cool about it, though I had some last minute questions. My travel agent, otherwise very helpfull, strongly suggested I should not check in any laggage because I could miss my connection flight in Munich. I said, ok I’m just gonna carry on my laptop bag and a small backback for the clothes with me on the plane. At this point things started to get vague. My agent informed me that there could be a chance I wouldn’t be allowed to carry two hand laggage on board since only one is allowed for economy class. Since it was already late in the afternoon and I couldn’t get to a store to buy a backpack big enough to fit my 17″ laptop in, I had to drop the backpack idea, an try to stuff as much as I could in my slim laptop case. I did manage to stuff enough clothes for the weekend but I ended up with an 8Kg laptop bag that was about to burst. Passing laggage security check with that bag was at least timeconsuming, Not to mention the return trip back (see day3). I had to catch an early flight so the day started at 5:00am. After a two hour joyfull trip from Thessaloniki (thanks bro) to Munich, I met with Pierre Stirnweiss at the airport. We were not seated next to each other so our chat was only a short talk about the situation in Greece at the gate before take off. After arriving at Vantaa airport, we met with Boudwijn Rempt and headed straight to Nokia’s office. We were expected by Thorsten and were (I think) the first to arrive. We took no time to rest. Laptops broke loose and started hacking. My self, I was working on minor UI stuff and expecting the rest of the Kexi team to gather up to talk further. People started coming and after making the necessary acquaintances got to hacking too. As Kexi team gathered up we started talking about general features to implement untill it was time to go for dinner. Day started a bit earlier than expected because the alarm on my second cell phone went off at 5:00am. I was so tired, I didn’t hear it untill Dmitry Kazakov (with whom I was sharing the room) woke me up to turn it off (sorry Dmitry), though I had no problem what so ever to go back to sleep afterwards. Got up at around 8:30 and had breakfast, leaving the hotel at 9:00. The whole Calligra team headed to Nokia’s office on foot and after a meeting with the whole group, SKF made a presentation regarding using Words in their in house software as a report generator. It was pretty interesting to see such a use case and even that Calligra was used by such a company. 2:00pm and we had lunch at Nokia’s inhouse restaurant (delicious btw). Shortly after returned to the office where we had a surprise coming. Guys working at Nokia (I think it was Thorsten) asked Nokia to give Calligra devs a mobile phone to develop on. And since the response was possitive, we had a lottery for 3 N9. The -no so fortunate ones- who didn’t get a winning lot, got as a concolation price a N950 (not bad at all if I may say). So I am now a happy N950 owner (well not exactly) waiting to start coding. BOFs started just afterwards untill there was time to go out for dinner again. This time it was a Thai? restaurant. Very spicy food, beer and long talks once it was again to return to the hotel. And the same old story. A quick shower and down to the lobby again to continue hacking. I believe me and Jaroslaw were the last to go to bed once again, planning new features for Kexi and finding the optimum way to implement them. Day 3 was just the same. Breakfast, office, hacking. Lunch in house and BOFs again. I would say that most of the time we talked about features to come in Kexi and making a very rough roadmap than hacking. BOF subjects were pretty well organized and presented by Jaroslaw, although I would expect more people to attend to the Integration BOF. Day 3 was cut short as at around 15:00 we had to leave to the airport. Me, Thorsten and 4 other guys (sorry, can’t remember your names yet) headed to the Vanta airport. We all rushed out to check in. I was for a big surprise as when looking for Finnair’s counter, I was told that my flight was cancelled. After going to Finnair’s info kiosk I was luckily told that was just an operator change for the flight (phew). Since we had some time untill boarding time, we had a short chat with the lads, and then boarded our flights. Since me and Thorsten were on the same flight to Frankfurt, we continued to talk a bit more untill finally we got a nap). After we parted, I spent most of the time during the flight to Thessaloniki fiddling my brand new N950. I arrived at Thessaloniki at about 22:45 having another hour to get home (thanks bro once more). Finally I would like to thank Nokia and KO for sponsoring not only transportation costs, but all wonderfull meals altogether. All in all, getting to meet the Calligra team and attending the Sprint made want to try harder, contribute more, be better. It just made me realise once more that switching to linux is worth the trouble. Spread the word! PS. I definately want to be able to attend to the next Sprint, and have more to offer by that time. I’ve already started studing QML, and have high hopes for Linux platform for mobile (even though Nokia seems not to be of the same opinion). I’ts just been my second patch submitted for Kexi and since I am new in C++/Qt I thought I should start with small usability patches until I get a good hang of KDE/Qt API, Code styling, etc. I’ve always been a fan of less mouse clicking. I always thought that any application (or it’s programmer) should be inteligent enough to know when a mouse click is needed or not. 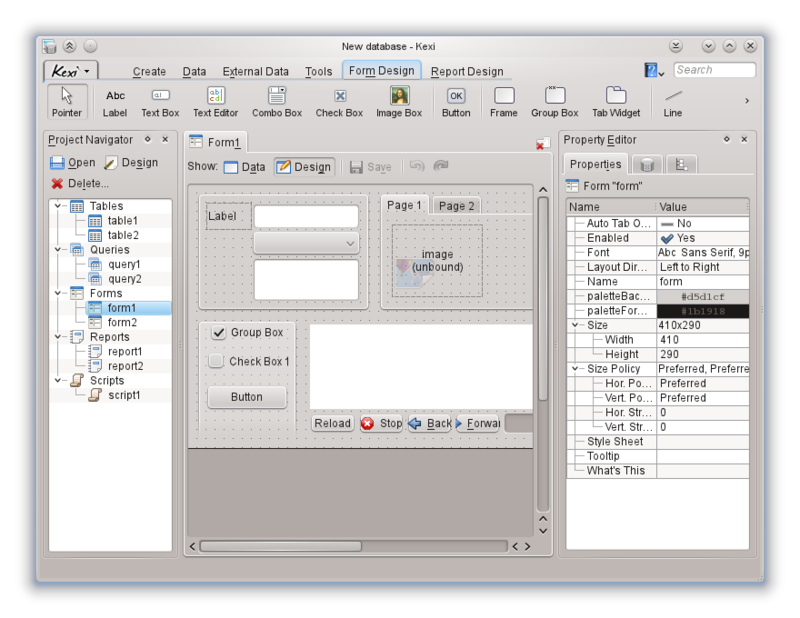 In that spirit I thought, when creating a new Form/Report Object, Kexi should focus the relative Form/Report Design Tab Page, since the next logical step after adding a new object in the database is to add display information to it (aka widgets). The same should also happen when opening an object in design mode. However this works (by intention) only when opening an object from the Project Navigator, NOT from object’s toolbar when it is already open and user switching to design mode. This is done so not to force the design toolbar on an already created object when the user might actually want to change e.g. widget’s alignment (which will be on another Tab Page later on). The same concept could also be usable in other Calligra apps e.g. focusing the Picture Editing Tool Toolbar in Words when adding a picture. 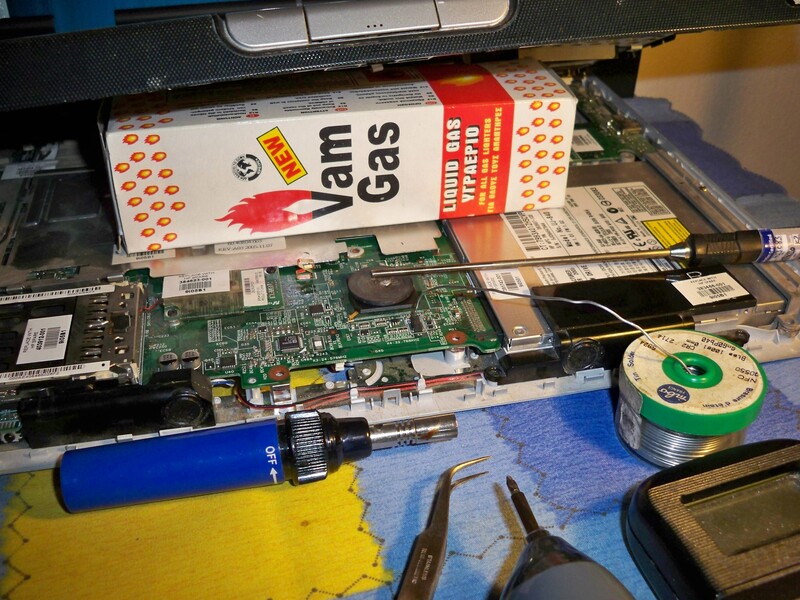 How to repair a dying laptop with a blowtorch (for real)! Well, it was about time I polluted the Internet with my thoughts and actions. So I’ll just cut to the chase. A friend gave me an old laptop (a HP dv4000) , mostly because it had a problem that made working rather cumbersome. Every once in a while the laptop froze completely. Not just the screen, but everything. The hard disk stopped, the touchpad and keyboard stopped responding and all usb devices too. Weird enough when I placed the laptop on the workbench, I discovered that if I applied some pressure over the touchpad when the laptop was frozen, almost everything went back to normal. The touchpad, keyboard and HDD started working. The USB devices however well long gone. Unplugging / pluggin again did nothing. For the USB ports to work the laptop had to be rebooted. I haven’t look used the laptop since I installed openSUSE on it. So it was time to make use of the linux goodies. Behaviour was as above. The laptop froze at random times, killing all peripherals. The kernel logs simply reported dazzled and confused when pushing over the touchpad. That was enough to think it was a hardware problem. So I put my mind to think. What controls all those peripherals? Of course! The southbridge chip. After disassembling several parts of the laptop it was time to dig in. I located the southbridge chip almost directly below the touchpad. That made sense for the pressure putting things to work again. So after poking around the Internet I found a few other similar cases and went to try for myself. The point is to heat the coin using the blowtorch to about 210C measured with the thermometer and put on the southbridge chip to transfer heap and allow the BGA solder balls to reflow, fixing our problem. During the heat transfer process, I was testing by moving the touchpad from time to time, to check when the chip would work properly. I had several tries at this. 210, 220, 250 degrees. However the temp dropped to quick when putting the coin on the chip to allow to reach the reflow temp. To help the procedure I had the laptop running all the time to provide additional heat to the southbridge chip. Nothing worked though. After getting pissed of, I decided to do things my way. I simply placed the coin on the chip, the K type sensor touching it next to it, and started heating the coin while ON the chip. I had several tries at this also. When I’ve had enough, I said to myself: “I’ll either repair it or throw it way”. And so I did. I was heating and slightly pressing the coin with the tweezers to help “resoldering”. I had to be extremely carefull here because a bit more strength would make the BGA ball stick together and destroy every chance of making the laptop work. I had to heat the coin up to 350C to get the balls to reflow and apply a very light pressure. 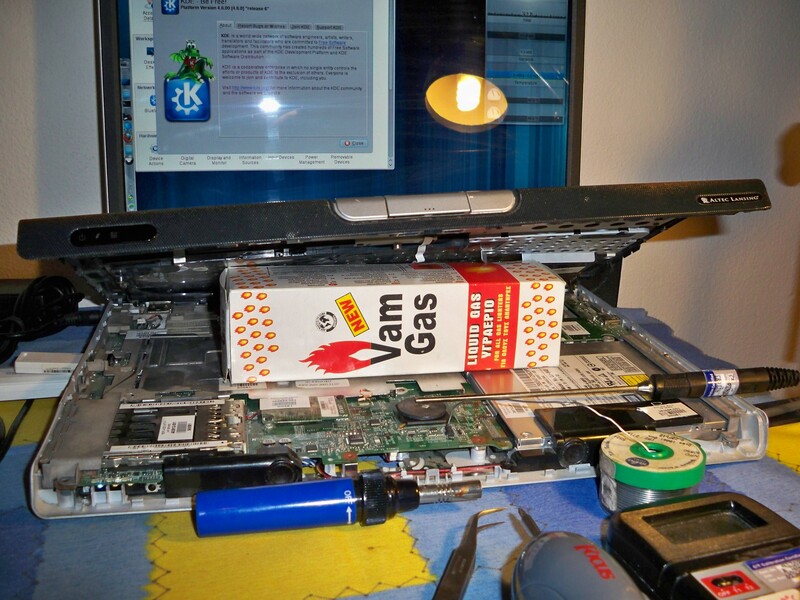 After I check the laptop was working fine, I let it cool done WITHOUT removing anything. Just let it cool gradually. THE RESULT? I got another fully working laptop available at my disposal. I didn’t record a video of the procedure because I didn’t think of it in time. I took however two pics at the cooling stage, for your pleasure and my bragging. enjoy!